The "data size" and "limited to standalone" aspects are worth commenting on. The architecture is currently 32 bit with 4GB of memory (and only 2GB available to processes). A 64 bit architecture with up to 20GB memory would be able to handle the size of data required. Applications like R and Weka would then have no problem with the larger datasets. With regard being isolated as a stand-alone machine, the ATO, rightly so, has very stringent processes in place to protect the integrity of its computer systems. In common with many large organisations there is confusion about GNU/Linux in an entrenched Microsoft-based standard operating environment. There is considerable doubt about the benefits of free, open standard, and quality software and considerable comfort in paying many millions in licensing fees to overseas companies! 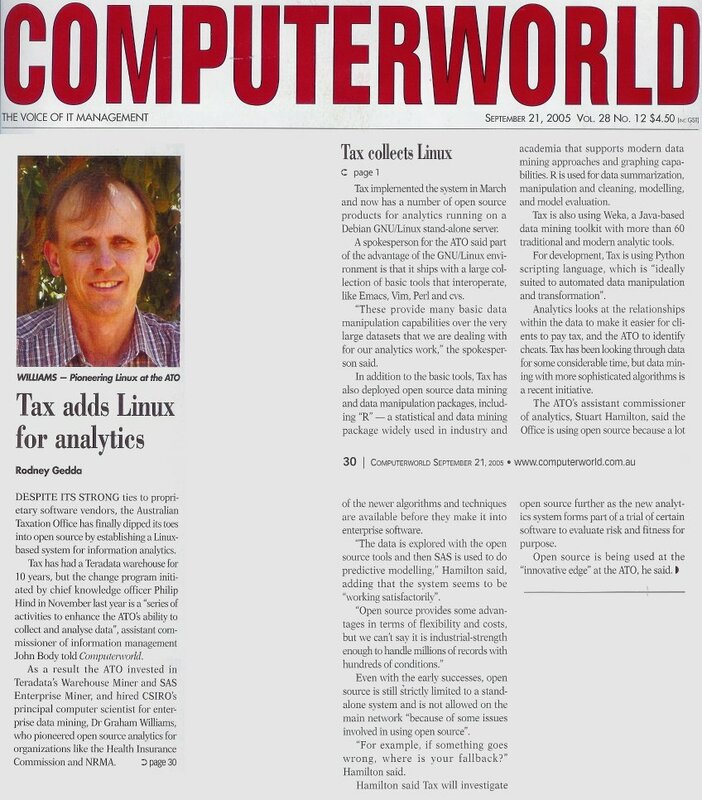 In my view, a GNU/Linux deployment would see a dramatic reduction in licensing costs and increased integrity of the spending of public monies, with investment in Australian capabilities.